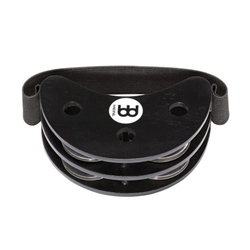 It's easy to incorporate some percussion into your act with the Meinl Percussion FJS2S foot tambourine. For the coffeehouse acoustic guitar player, the rock drummer's "quiet kit," or percussionists whose hands are busy laying down the groove, the FJS2S is the opportunity to add the distinctive tambourine tone to your show. You could even use it for a hi-hat sound in a folk kit with a cajon as a kick drum. With its ability to be utilized in all of these situations, the Meinl FJS2S is a great addition to your percussion setup.